BASH Enterprises is back with a vengeance! We are now in full production of the huge 8 foot Mongo Sr. and its light lift counterpart, the famous Mongo Jr. Kits are available now and ready to ship. Both kits include: Wing cores and beds, tips, tapered elevons, and a full set of instructions. 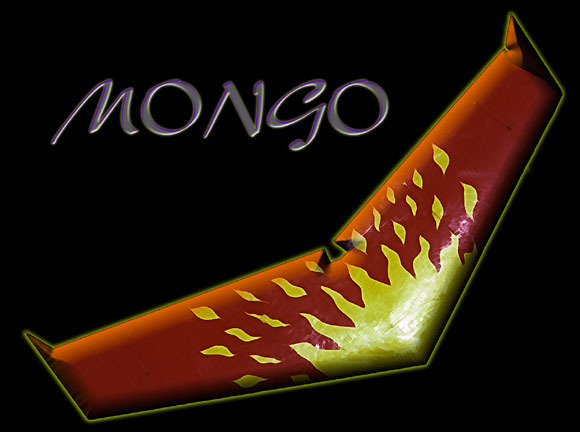 You can see pictures of both versions of the Mongo combat flying wings here. And, for those of you that must get out to fly in the worst of weather... There's the Mongo Transmitter Mitt!! The Mongo Transmitter Mitt is made of 200 denier nylon with polar fleece lining and Velcro closing. It can be made any size to accommodate the largest radio. If you use a neck strap, the face plate is split and trimmed in the nylon, then overlapped with an opening to allow the neck strap to pass through without letting rain drip in.